Repair of Bravo Docks B7 – B9 | Sea Engineering, Inc.
Sea Engineering has played a key role in concrete restoration efforts at the wharves, docks and piers of Pearl Harbor Naval Base. Projects have included concrete spall repair, cast-in-place repairs of impact damage to pier facilities, epoxy crack injection, replacement of mooring hardware, pipeline removal and pipeline support upgrades, installation of fendering and fender piles, installation of catwalks, access ladders, hatches and replacement of damaged bearing piles. 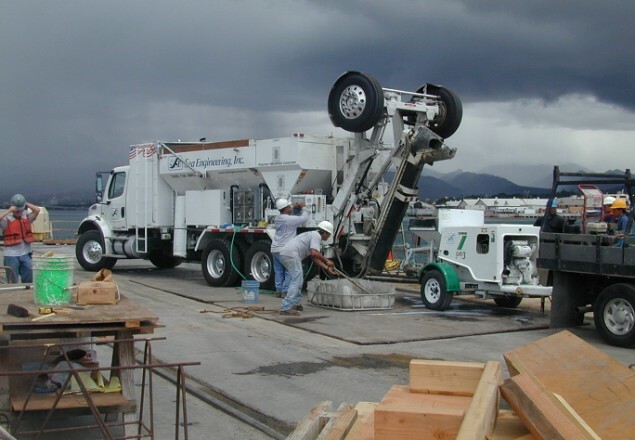 Sea Engineering also prepares our MCD 8-100 volumetric conrete mixer with various concrete mixes including the Polymer-Modified concrete used in the Pearl Harbor Naval Base projects.